Following the example of the U.S. Forest Service, the National Center for Health Statistics, and the National Institute of Environmental Health Sciences, the U.S. Environmental Protection Agency (EPA) established its Environmental Research Center in Research Triangle Park (RTP) in the Raleigh-Durham area in 1971. The center's main focus has been the research and assessment of various environmental pollutants, especially their risk to humans and their ecological effects. Employing more than 1,400 people, North Carolina's EPA facilities include the National Exposure Research Laboratory, National Health and Environmental Effects Research Laboratory, National Risk Management Laboratory/Air Pollution Prevention and Control Division, and National Center for Environmental Assessment. The EPA Office of Administration and Resources Management, Human Resources Management Division, and Office of Air Quality Planning and Standards are also located at RTP; a Clinical Research Facility and a Human Studies Division are at the University of North Carolina at Chapel Hill. "About RTP. Research Triangle Park, NC." Environmental Protection Agency. http://www.epa.gov/rtp/aboutrtp.htm (accessed November 29, 2012). Environmental Protection Agency. "Our Green Campus- A Model for the Future." [Research Triangle Park, N.C.?]. Environmental Protection Agency. 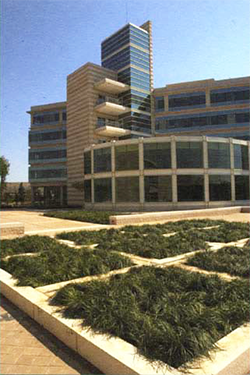 2008. http://www.epa.gov/rtp/campus/environmental/our_green_campus.pdf (accessed November 29, 2012).